As the role of sport in society becomes ever more prominent and as sports organisations become increasingly influential members of the global community, so it has become more important than ever for sport to consider its wider social responsibilities. 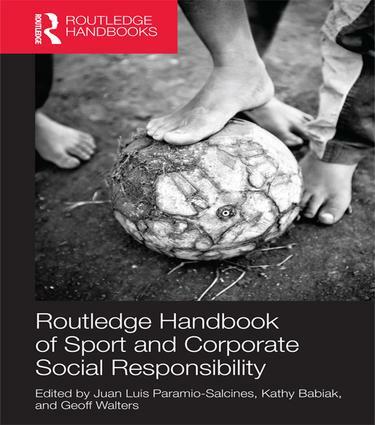 The Routledge Handbook of Sport and Corporate Social Responsibility is the first book to offer a comprehensive survey of theories and concepts of CSR as applied to sport, and the social, ethical and environmental aspects of sport business and management. It offers an overview of perspectives and approaches to CSR in sport, examines the unique features of the sport industry in relation to CSR, explores the tools, models, common pitfalls and examples of best practice on which managers can draw, and discusses how CSR and corporate citizenship can be integrated into the sport management curriculum. The book covers every key issue and functional area, including implementation, strategic benefits, communication and corporate image, stakeholder engagement, and the measurement and evaluation of CSR policies and practices, and includes detailed international case studies, from the NBA and the Olympic Games to Japanese soccer. The Routledge Handbook of Sport and Corporate Social Responsibility is important reading for any student, researcher, manager or policy maker with an interest in sport business, management, ethics or development. Juan Luis Paramio-Salcines is a Senior Lecturer in Sport Management at Universidad Autonoma de Madrid, Spain. His principal scholarly interest includes sport facilities and event management, commercial development and accessibility provision of stadiums, the economic impact of sport events and Corporate Social Responsibility in Sport. His work has been published in Sport and Society, Soccer and Society, American Journal of Economics and Sociology, Urban Affairs and Sport Management Review. Kathy Babiak is an Associate Professor of Sport Management at the University of Michigan, and Co-Director of the Michigan Center for Sport Management and the Sport Health and Activity Research and Policy Center for Women and Girls. Her research focuses on the intersection between sport and society – particularly as it relates to social responsibility and the professional sport industry. Her work in this area has appeared in Journal of Business Ethics, Journal of Sport Management, Journal of CSR and the Environment among others. Geoff Walters is a Lecturer in Management at Birkbeck, University of London and director of the Birkbeck Sport Business Centre. His research interests include board-level governance and corporate responsibility, with a particular focus on the sport industry. He has published numerous articles in journals such as Business Ethics: A European Review, Journal of Management and Organization, the Journal of Corporate Citizenship, and Sport in Society among others. Foundations of Sport Management is a discipline-defining series of texts on core and cutting-edge topics in sport management. Featuring some of the best known and most influential sport management scholars from around the world, each volume represents an authoritative, engaging and self-contained introduction to a key functional area or issue within contemporary sport management. Packed with useful features to aid teaching and learning, the series aims to bridge the gap between management theory and practice and to encourage critical thinking and reflection among students, academics and practitioners.